Using this magnet for today, because someone reminded me that it's already been a year since our golf course tv shoot down in Tampa. 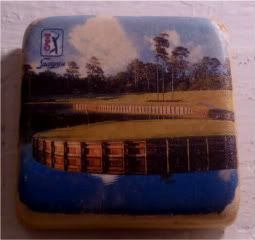 Same friend picked this up for me at THE PLAYERS Championship earlier this year. The 17th hole island green is the signature hole for the TPC Sawgrass Stadium course, in Ponte Vedra Beach, FL. The 17th is one of the hardest on the TOUR, because the green is set on this island-slash-peninsula in the middle of this water feature. It was built kind of accidentally - Pete Dye (the course's designer) didn't intend for it to be that way - but they were digging and digging and digging, and one day, Pete brought Alice out on the course under construction, and she suggested the island. And so it came to pass. It's definitely a storied hole. The record for one tournament is 50 balls in the water, rather than on the green. And check out this fun retrospective on the hole. Of course, it gives me yet another reason to like birds, but whatever. I have a love-hate relationship with the island green. I loved to watch professional millionaires knock it into the water... but I hate that a tournament can be won/lost on a hole that might belong next to a windmill on a mini-golf course. Interesting viewpoint. I never thought about it like that.